A guitar fit for a guitar hero. Beautifully built, great range of subtly different tones, great-feeling neck profile. Some may not like the f-hole look, plus it’s £500 more than an American Original Strat. When Eric Johnson lends his weight to a revamp of the planet’s most famous electric guitar, the six-string world takes notice. 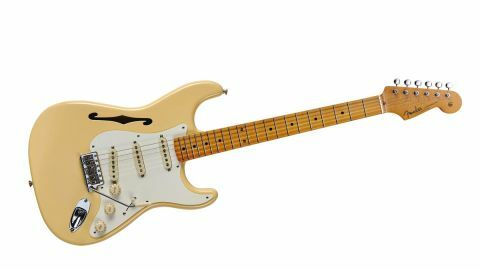 With Fender itself as his co-conspirator this is the Texan virtuoso’s third tweak of his favourite musical tool, and one that led to the company’s first semi-hollow Stratocaster with full body contouring and vintage vibrato system. Renowned tone-hound Eric was looking to create a lightweight instrument that offered a subtle but distinctively different voice to that of a conventional Strat. Johnson was inspired by his love of the Gibson ES-335 with its markedly more dynamic range when compared to the electronically similar Les Paul. We asked Eric how the final design came about. The bridge single coil features a tone pot but otherwise it’s all standard Strat fare with one master volume, two tones and a five-way selector controlling the trio of pickups. Although the EJ features Fender’s vintage vibrato system, here it’s locked down with all five springs fitted; there’s no back plate either, and no pre-drilled attachment holes should you want to fit one. Staggered height tuner posts obviate the need for friction-inducing string trees and make for a fuss-free look to the headstock. Subtle changes are afoot with playability, too. After testing several prototypes Eric settled on a newly sculpted ‘soft V’ neck, said to evoke the perfect meeting of vintage and modern. Topped off with a Gibson- style 12-inch (305mm) fingerboard radius it works equally well for his finger-twisting chords as for those deftly accurate solos. We’ve played this ‘vintage-meets-modern’ neck before, on Eric’s previous signature Strat - in fact, he told us that, aside from this one’s semi-hollow nature the two models are identical. It’s a great handful: slightly beefy in the palm, but the totally un-Fender fingerboard and slightly taller frets give the player a distinctly up-to-date experience - more Anderson- or Suhr-like perhaps? Johnson worked with Fender to voice the three single coil pickups that power his signature Strats, and of course insisted on that tone control for the bridge unit. This is one of the secrets of EJ’s sound: for those chiming, open-voiced chords he looks for the cleanest, brightest output from the bridge pickup; while for his trademark ‘violin tone’ solos he winds this pot back for an almost ‘woman tone’ effect, adding a fuzz or Tube Driver and lashings of delay. We try to steer clear of generalisations when it comes to tone - “Mahogany sounds like this, swamp ash like that,” etc - but there are certain truisms to how a guitar’s construction will affect its sound. When it comes to solid versus semi-hollow we can broadly state that while a Les Paul tends towards a tight, defined tone with even response across the tonal spectrum, an ES-335 will seem more scooped in the middle, thus creating a less in-your-face sound with more dynamic choices for the player. Matched alongside this reviewer’s own Custom Shop Strat and both fired up through our ubiquitous Blues Junior test amp, the EJ felt immediately lighter underfoot than the dark toned, rosewood boarded Relic. How much of that was down to the maple neck versus rosewood and the Fat 60s pickups compared to the Johnson-Fender voiced set, who’s to say? All the expected clean sounds were there, but somewhat ‘prettier’. Crank up the wick, though, and it really does take on a different nature, blossoming with sweet, juicy fatness. Think of Eric’s sounds and they are never ferocious, just big, fat and controlled, and that’s clearly what he was going for here. Of course, every molecule screams ‘Strat’, so no big surprises here for the unwary. ‘A Strat is a Strat is a Strat,’ you might say. But the truth, as demonstrated by this interesting twist from the Fender-Johnson camp, is that the permutations such a timeless format can offer are endless. as a Tele (which raises the question; why didn’t they simply chamber it, put the alder cap on and forget the f-hole?). But all agreed it gives the instrument a unique identity; it does do something to the tone and some of us got to really like the look. Now, whether or not the semi-hollow build provides enough of a sonic difference from, say, last issue’s excellent American Original models, only a personal audition will reveal. But we liked what it seemed to do when compared to our regular vintage style model. And anyway, who’s going to argue with the ears of Eric Johnson?